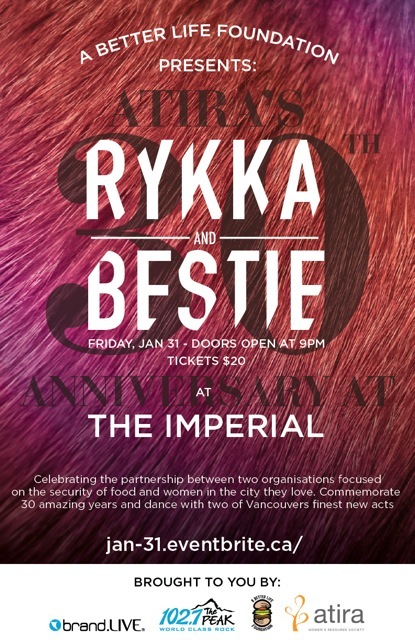 On January 31st, 2014 The Imperial in Vancouver is hosting the 30th Anniversary of Atira with special performances by BESTiE and RYKKA. This event will celebrate the partnership between Atira and A Better Life Foundation, both these organizations work tirelessly to tackle some of the issues that the Downtown East Side of Vancouver faces year round. Janice Abbot, CEO of Atira, focuses on ending violence against women in the DTES through education, outreach and advocacy while Mark Brand, CEO of A Better Life Foundation, focuses on food security and employment of those in the DTES. brand.LIVE is thrilled to be part of this amazing cause and has worked with the organizations and 102.7 the Peak to create a night of music, education and community outreach.